A Pomeranian's coat can be beautiful when properly groomed. Pomeranians have a thick double coat that can easily become matted. While you may be tempted to shave your Pom, it's not recommended as part of the home-grooming process. Health risks are associated with shaving a Pomeranian too close, so you'll want to choose a skilled groomer. 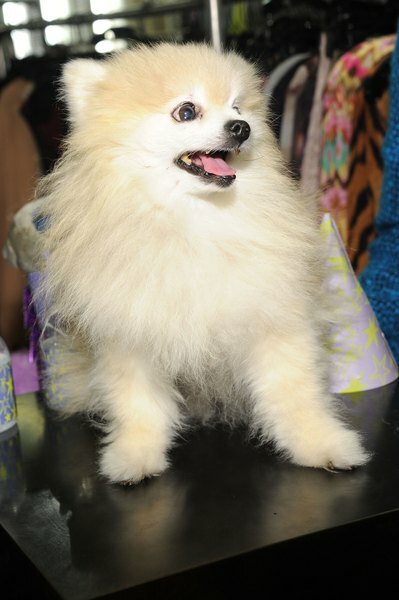 Pomeranians have coats that can be damaged through clipping and shaving. When the hair is groomed too short, the hair may grow back fuzzy with a wiry texture. Another problem is that the coat protects Pomeranians from both the heat and cold. If the coat is shaven too short during the hot weather, it can actually make it harder for the dog to stay cool. In some cases, shaving a dog too short can lead to post clipping alopecia. Post clipping alopecia is when the hair follicles become damaged and the hair doesn't grow back for six to 12 months. This can seem like an eternity when your pet is walking around bald. This usually happens when pets are shaven too closely for surgery, but it can also be the result of improper grooming. Before you choose to give your Pomeranian a lion-cut on your own, remember that it may end badly. Your Pomeranian needs grooming on a daily basis. You will need to brush your pet for at least 15 minutes each day to prevent the hair from matting. Twice a week, brush the coat with a curved back slicker brush, holding the fur in one hand and brushing with the other. This prevents you from pulling the hair. Daily brushing with a regular bristle brush through the rest of the week will keep the coat from matting and will remove dead hair. Most people are not skilled groomers, which leads to pets looking like they have mange. Find a professional groomer who is certified and has experience with Poms. This ensures that your dog's coat is properly groomed without causing post clipping alopecia. You should be aware, though, that any shaving can cause the texture of the hair to change. Do Pomeranians Have Separation Anxiety? Can a Pomeranian Get a Haircut?